A long holiday weekend is upon us. Here is a little tip for sneaking bliss. The kids were tired, the day was hot and we were all sticking to the car’s seat. The AC was out. Again. One more stop. One more store then we could call it a day and go home. Unbuckling, we all peeled ourselves off the hot seats and crossed the parking lot, picking up a little gum on our shoes along the way. It appeared that everyone in the store was having the same kind of day. Frowns everywhere. Tired, hot, sweaty, frowns. “Mom, nobody is smiling,” the worried little voice broke through the grim silence of the grocery shoppers. Everyone in earshot stared. Then… they all smiled. Our little family game was born. From this day forward it was our tradition, how many smiles could we get when in a store. It does not sound like much. But try it. Smile. Count how many you get in return. And don’t worry about the ones who do not reciprocate, they need your smiles the most. Not only will you sneak a little bliss, but you will share a little as well. Our grandkids love to color. 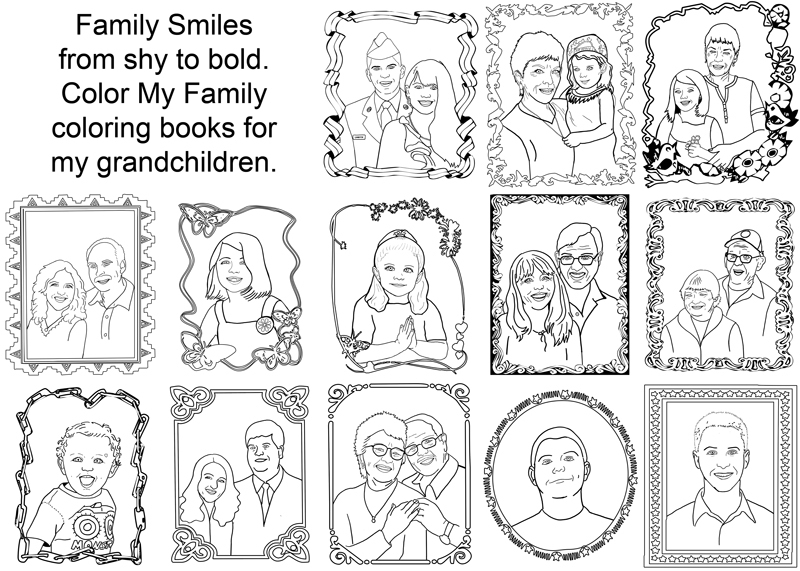 Using predesigned frames, I inserted line drawings of each of their family members, from siblings, to great grand-parents. The smiles make them great. Our smiles, whether shy or bold, are remembered by our grandchildren. Sneak a little bliss, smile. This entry was posted in Bliss Tips, Child's perspective, Children's Art, Influence, Planting Seeds and tagged Art, Children's Art, Children's Books, Coloring Book, Drawing, Family, Grandchildren, Grandkids, Inspiration, Planting Seeds, Sneaking Bliss, Tips by MaryALivingston. Bookmark the permalink. What a fun coloring book! The kids just LOVE them. We made one to color and one to keep. I love this !! Great idea !! It is so much fun to do, and the kids love it. I did one for both granddaughters, now it is time to do one for my grandson.